Nationwide, people are collecting, preserving, and sharing seeds to protect the future of food and farming. At first glance, the three women hunched over tomato starts in a garden behind St. Stephen’s Church in the Northern California town of Sebastopol don’t look like revolutionaries. They’re not bearded and stoic like Che Guevara. They’re not bespectacled with a dramatic flair for oration like Malcolm X. And they’re not rousing a crowd of thousands at the People’s Climate March like Bill McKibben or Naomi Klein. But, take a closer look and you’ll see that these women are engaged in a quiet, often unrecognized, form of revolution: the act of propagating and preserving locally grown and adapted seeds with an eye towards food security for the surrounding community and future generations. “We’re like the grandmothers, protecting the seed,” says Sara McCamant, who in her early 50s is the youngest of the three. McCamant is one of 10 core volunteers at the Community Seed Exchange, an all-volunteer organization dedicated to growing and giving away locally grown, open-pollinated seeds. Seeds, these grassroots activists say, are an overlooked link to building a resilient local food system. For the last eight years, the seed exchange has steadily grown both as a repository of seed and a seed-saving network. 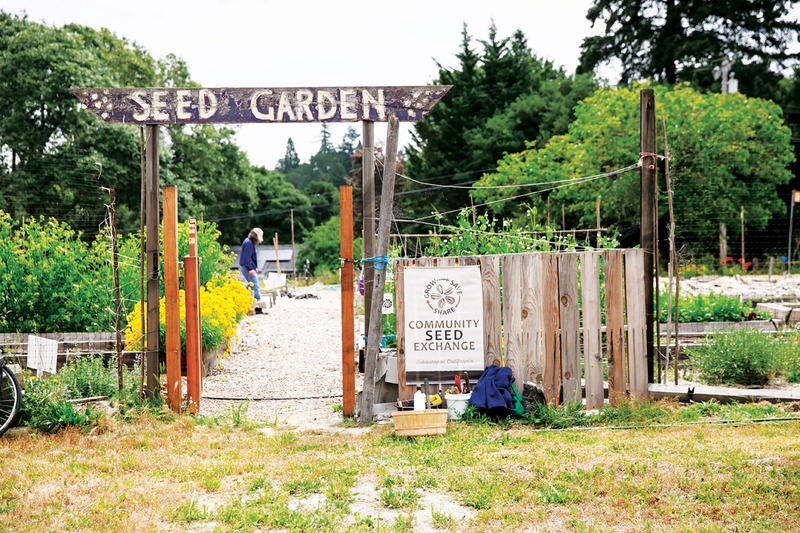 They do this through work parties, workshops, and a library that offers—for free—about 200 varieties of 100 percent locally grown, open-pollinated seeds. On a recent visit, the shelves of the seed library are filled with jars of flower, vegetable, legume, and grain seeds, from bachelor’s buttons to barley. “These are all free?” one visitor asks, eyes flush with excitement as they portion palmfuls of Mayan lettuce and fennel seeds into small envelopes. It’s so against the norm in America—where anything that can be sold usually is—as to seem unreal. “All free. This is the real sharing economy,” says McCamant. The only requirement is that you take only what you need and leave behind plenty for the next person. It doesn’t surprise McCamant—or, for that matter, any other seed savers who’ve been at this for a long time—that free seeds astonish amateur backyard gardeners who’ve become accustomed to buying pretty seed packets from the store. Everything grown in the seed garden is open-pollinated: Cascadia Sugar Snap Peas, Red Venture Celery, Detroit Red Beets, Cascade Corn, Ruby Valentine lettuce, Sonora White Wheat. The plants are selected for a host of reasons. The celery is a good producer and comes from Frank Morton, a famous Pacific Northwest plant breeder and staunch advocate for open-pollinated seeds and open-source seeds; the wheat is the oldest in California and grown for its historical significance; the lettuce is a heirloom sold by one small seed company and it stands a good chance of being lost if not cultivated. Eventually, these seeds will be harvested, sorted, cleaned, and added to the library’s inventory. The one thing you won’t find in the Community Seed Garden are hybrid seeds. These are the seeds favored by Monsanto and other big agri-businesses in which one plant is crossed with another to create a whole new organism. Hybrids may guarantee higher yields and hardy plants for one season, but good luck saving the seed and planting them again next year. The seed will revert back to the traits of its parents, meaning you have no idea what you’re going to get or how it’s going to taste. In this way, the big seed companies have become more like landlords of seeds, renting to farmers and other growers year after year, and making billions in profit. That question is finding some answers with Steve Peters, a research and outreach associate for the Organic Seed Alliance (OSA), a Port Townsend, Washington-based nonprofit that is working to develop and improve seed production and marketing opportunities for seed growers. In the past, Peters has consulted with Bohemian Seeds, a small open-source seed business out of Occidental (you can find their seeds at the Sebastopol Farmers’ Market) and Eric George, a young farmer in Petaluma. OSA recently launched a pilot project in California to build local seed hubs—for cleaning, processing, and storing seeds, and where growers can connect with commercial farmers. U.S. backyard gardeners, with their varied choices, are going to be okay, according to Peters. The true challenge lies in finding good quality, open source seeds that are worthy of the physical traits and germination needs desired by commercial growers. With consolidation comes less choice. Plus, since the business model is to own the material you sell, severe patent restrictions have been placed on the products, meaning farmers can’t legally save seed and they definitely can’t use patented varieties to develop their own locally adapted versions. Still, modern hybrid varieties draw farmers in with their high, reliable yields. The problem arrives when they aren’t adapted to changing conditions and those record yields turn to nothing. “You’re really in trouble then,” says Peters. In Petaluma, seedsman and farmer Eric George has been growing produce for projects that support the Open Source Seed Initiative (OSSI), a national organization dedicated to the cause of “freeing the seeds.” Originally developed for computer software, the open source model makes intellectual property— whether computer code or seeds—freely available for use and provides a way for that material to stay freely available in perpetuity. Seed breeders that sign the OSSI pledge vow to keep their seeds free of patents, licenses, and other restrictions on freedom of use. OSSI stores a database of crop varieties that have been pledged as what they call “freed seed” and provides links on its website to where those seeds can be purchased, whether from seed companies or individual breeders and seed growers. They also build awareness of the importance of keeping seeds unencumbered from legal restrictions and free to be used, shared, saved, bred, and sold. In 2015, George was invited to join OSSI’s partnership committee. At the age of 28, he’s the committee’s youngest member. Recently, George launched a new seed company, Coast Range Seeds. He first started thinking seriously about the power of seeds after reading First the Seed: The Political Economy of Plant Biotechnology by Jack Kloppenburg. Inspired by the U.C. Berkeley agroecology program and from campesino field days in 2011 and 2012 with seedsmen in Nicaragua, he moved north to train in western Oregon, a modern epicenter for organic and open-source seed. He enrolled in the Rogue Farm Corps, apprenticed with seed producers, and in 2013 helped form the Southern Oregon Seed Growers Association. Two years ago, George returned to the North Bay and dove into the consumer end of the supply chain, selling vegetables as a floor worker at Good Earth Natural Foods in Marin. He says it was a chance to observe the workings of the organic vegetable trade, tune in to what resonates with customers, and soak up the experience of a veteran produce team. He also began to notice opportunities to bring OSSI seeds and produce sales together. Now, as a seedsman, he’s working to bridge the two. Last year, he and Bolinas farmer Caymin Ackerman of Big Mesa Farm grew and delivered OSSI varieties “Candystick Dessert Delicata” and “Magma” mustard, to Good Earth, which, in turn, represented these crops to their customers. Back at the Community Seed Exchange, the biggest goal is to get home gardeners to think about where their seeds come from. On the last Saturday of the month, the volunteers open up the seed library to the public. They also host a work party in the seed garden, which offers an opportunity to get your hands dirty, and they offer free classes monthly on topics like seedsaving basics, wet and dry seed processing, and how to grow milkweed and nectar plants to lure monarchs to your garden. They’re always looking for more volunteers to spread the word about locally pollinated seeds versus their globe-trotting industrially farmed hybrid cousins. This article originally appeared in Made Local Magazine and is reprinted with permission. All photos © Michelle Feileacan. Great work. I live in Canada.